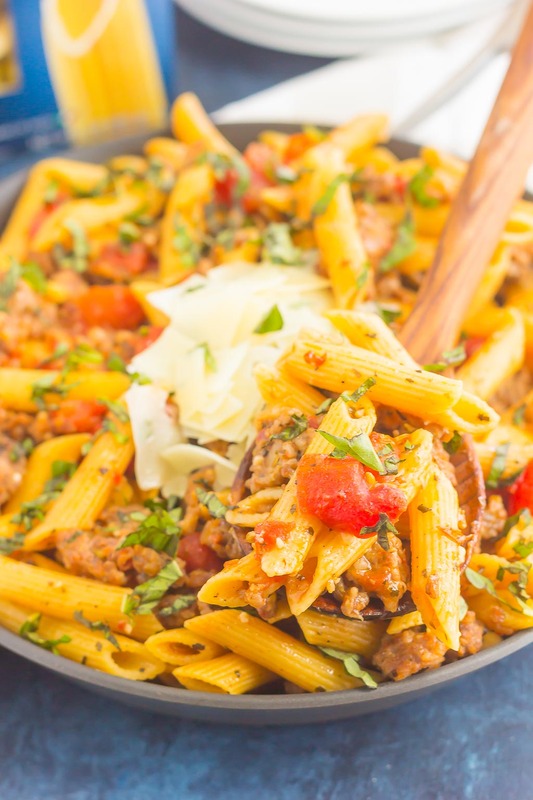 This Tomato Basil Pasta with Italian Sausage is an easy, one pan meal that’s perfect for busy weeknights. 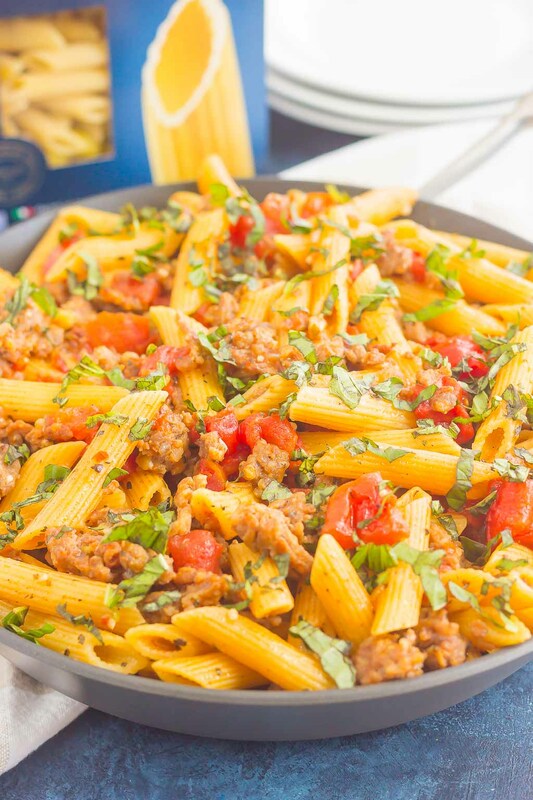 Filled with tender pasta, Italian sausage, and tossed in a simple tomato basil sauce, this dish is ready in less than 30 minutes and will become a new dinnertime favorite! If you’ve been hanging around here long enough, then you know that easy meals are the name of my game. In fact, I created Pumpkin ‘N Spice specifically for simple recipes of all sorts, from appetizer to main dishes to desserts and drinks. Who has the time or the energy to slave away in the kitchen when life is so busy? 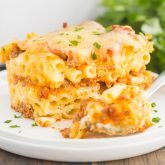 Sure, there are those occasions and dishes where you want to dedicate more time to them, such as a layered cake or homemade lasagna. But, for the most part, easy-peasy is what happens on this little corner of the internet. 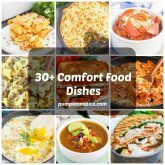 Geared towards families, working adults, parents, or for those that don’t want to spend hours in the kitchen, these recipes were made for you in mind! Remember, I’m all about the easy dishes and I promised you a while ago that I would have some hearty comfort dishes come fall. Well, that time is now, friends! 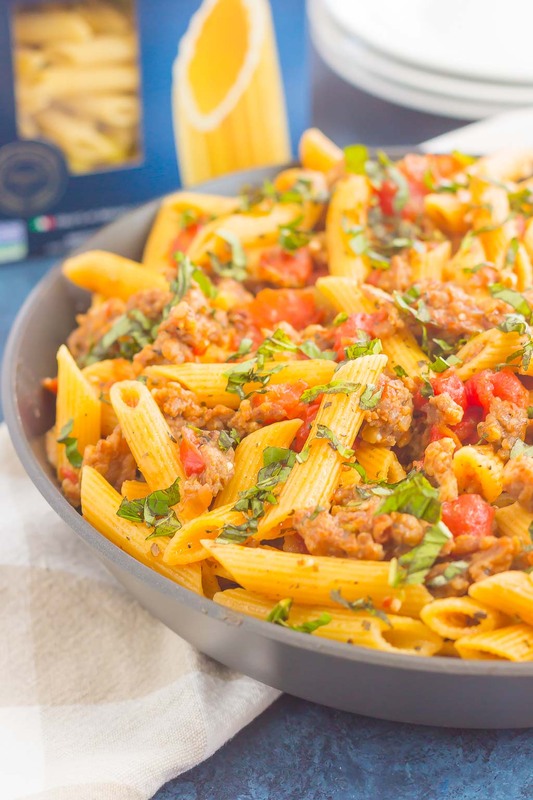 This Tomato Basil Pasta with Italian Sausage not only comes together quickly, but it tastes (and looks) like a meal that took hours to prepare. Which means this is great to serve for your family or for when those hungry dinner guests arrive. And because this is a one pan meal, that means less dishes and less clean-up. That’s always a winner in my book, friends! To start, you’ll want to crumble and brown the Italian sausage in a large skillet over medium heat. Once the sausage is cooked, add in some minced garlic and saute for another minute. Then, you’ll add some chicken broth, diced tomatoes, seasonings, and the pasta to the skillet. Stir everything together, bring to a boil, and then turn down the heat and simmer until the pasta is tender. Add some milk to the skillet and then boil for another few minutes until it thickens just a little. Remove the skillet from heat, add in some fresh basil and shaved Parmesan, and your dinner is ready to be devoured. 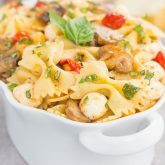 The flavorful Italian sausage, combined with the tender pasta, basil and tomatoes makes the most delicious flavor explosion that everyone will enjoy. Simple, fast, and bursting with flavor, you’ll be making this Tomato Basil Pasta with Italian Sausage over and over again! 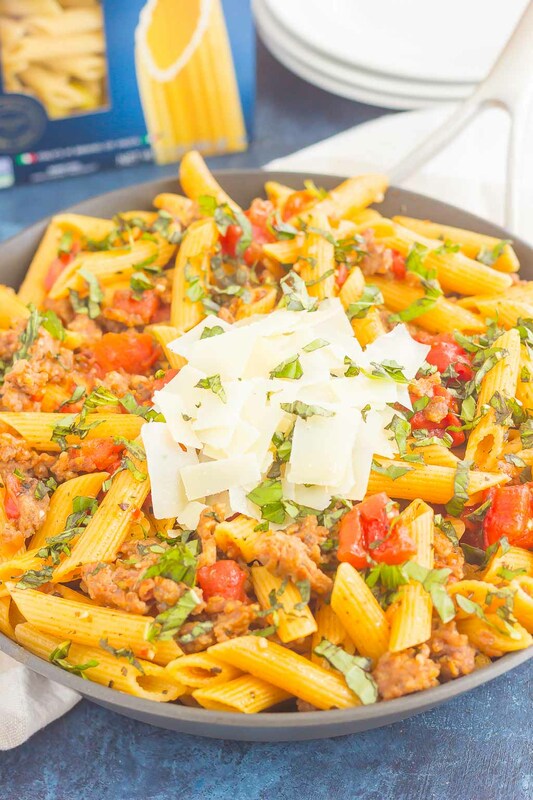 This Tomato Basil Pasta with Italian Sausage is an easy, one pan meal that's perfect for busy weeknights. 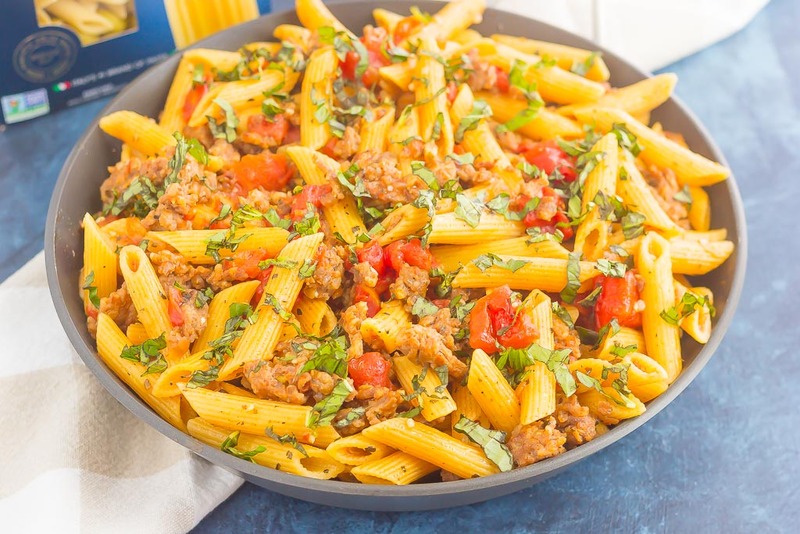 Filled with tender pasta, Italian sausage, and tossed in a simple tomato basil sauce, this dish is ready in less than 30 minutes and will become a new dinnertime favorite! Heat a large skillet over medium heat. Add Italian sausage and crumble and brown until no longer pink. Add minced garlic and cook for one minute. To the skillet, add chicken broth, water, diced tomatoes, dried basil, salt, pepper, oregano, onion powder, and penne pasta. Stir, bring to a boil, and then reduce heat and simmer for 10-12 minutes, or until pasta is tender, stirring halfway. Remove from heat, stir, and sprinkle with fresh basil and shaved Parmesan, if desired. Let sit for 5 minutes before serving. I love making pastas that don't really require a sauce...it's so much easier! This is a meal that we would devour here -- turkey sausage is a favorite! I love a pasta that doesn't really need a sauce too! It allows for so much more flavor to come through which is the BEST. This sounds delicious! Thanks for the sweet comment, Lindsay! Thanks for the kind words and for stopping by, Alia! Hope you love it if you try it! 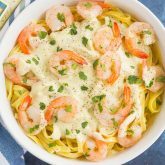 So easy to make, looks like the perfect weeknight dinner! I need to find this Barilla pasta. Pinning!